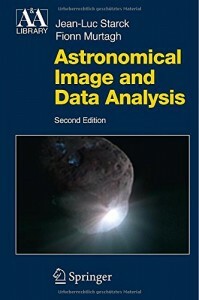 Starck, J.-L. and Murtagh, F. Astronomical Image and Data Analysis: , Springer,2006. (ISBN-10: 3-540-33024-0). Order now from Amazon.com. Description: With information and scale as central themes, this comprehensive survey explains how to handle real problems in astronomical data analysis using a modern arsenal of powerful techniques. It treats those innovative methods of image, signal, and data processing that are proving to be both effective and widely relevant. The authors are leaders in this rapidly developing field and draw upon decades of experience. They have been playing leading roles in international projects such as the Virtual Observatory and the Grid. The book addresses not only students and professional astronomers and astrophysicists, but also serious amateur astronomers and specialists in earth observation, medical imaging, and data mining. The coverage includes chapters or appendices on: detection and filtering; image compression; multichannel, multiscale, and catalog data analytical methods; wavelets transforms, Picard iteration, and software tools. This second edition of Starck and Murtagh's highly appreciated reference again deals with topics that are at or beyond the state of the art. It presents material which is more algorithmically oriented than most alternatives and broaches new areas like ridgelet and curvelet transforms. Throughout the book various additions and updates have been made.